This is the first of what will doubtless be many entries about Pizza Huts. In 1999, Pizza Hut HQ decided that eat-in restaurants were no longer viable, and spent the next ten years selling them off. Only a handful, if that, still exist. What’s funny is how the new owners mostly haven’t bothered to disguise that their new acquisition was once a Pizza Hut, but we’ll get to those. This one is fair enough; it’s just another restaurant. Why change it? 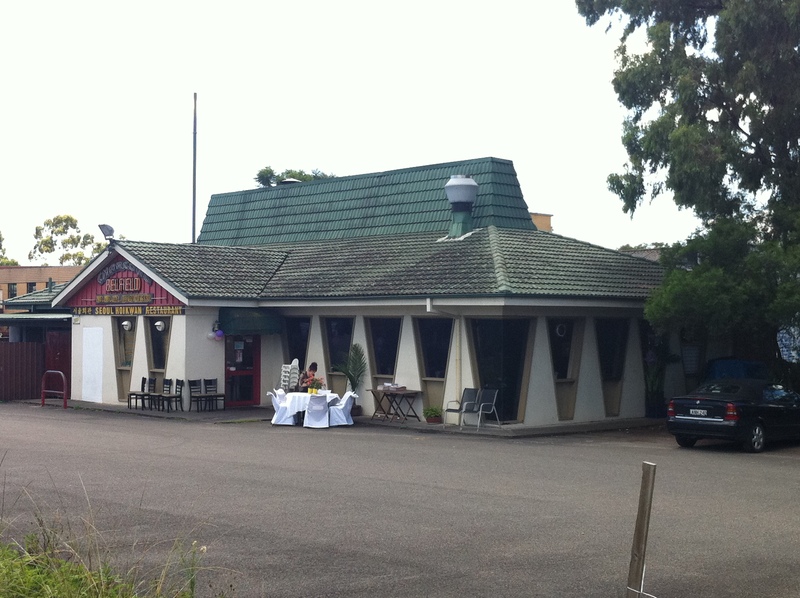 However, this one is notable because it was Australia’s first Pizza Hut. It was built in 1970, and apart from its iconic red roof now being green, it doesn’t look that different. You missed a spot, guys. Nice! 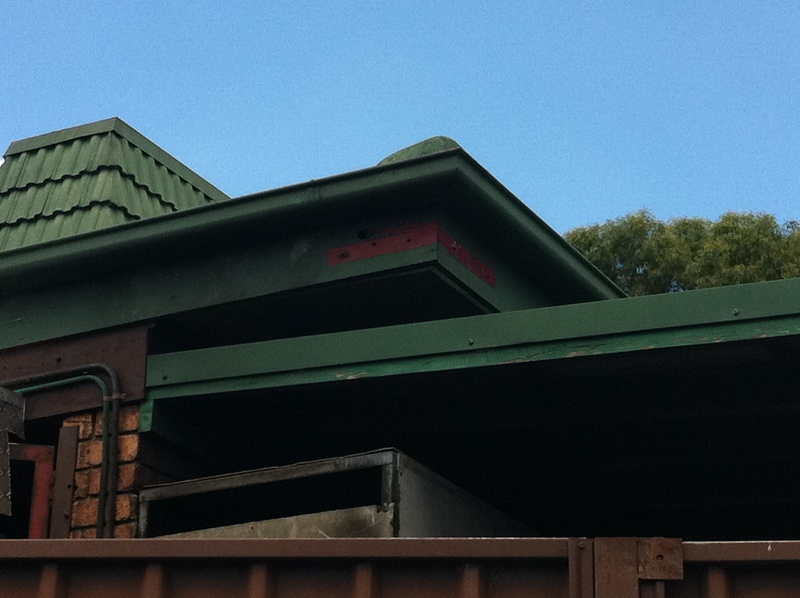 The red paint is probably because a bracket was removed, after the green paint went on. My mum used to take my brother and I to Pizza Hut for dinner, it was great! The yummy smell of the whole place! Dad wouldn’t go, let alone easy a pizza. He hated the smell of the cheese! 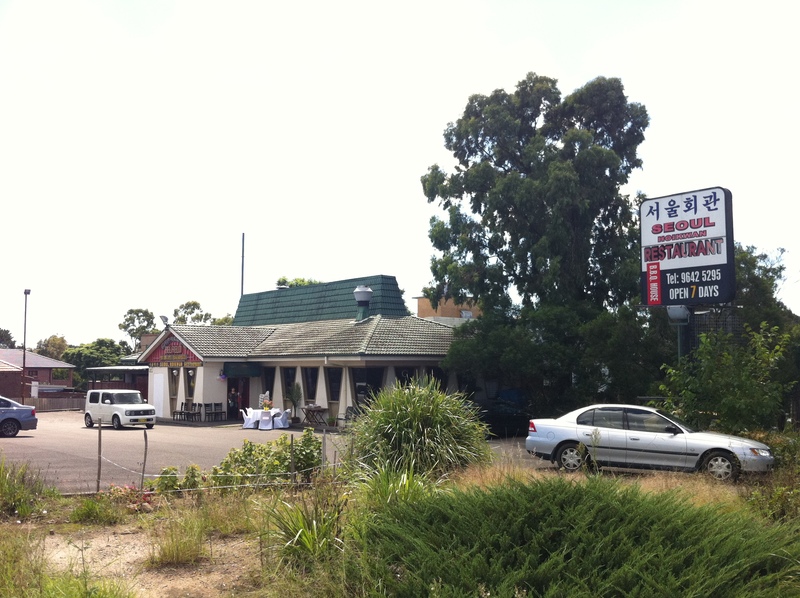 We went to Pizza Hut, Hume Hwy, Yagoona. Which later became Salvos. Then that got burnt down. Then they rebuilt the Salvos store on the same footprint. There was also a nice little Pizza Hut restaurant on The Mall, Bankstown. And my brother and I would go there for all-you-can-eat (including dessert), then go across the road to the Hoyts cinema, for a movie. Those were the days! These days it still has the same building structure. I think you have a picture (or more) of it. An application has been placed before Strathfield Council to “demolish existing structures and construction of an eight (8) storey residential flat building including two (2) ground floor commercial tenancies over three (3) levels of basement carparking.” You can examine stormwater, traffic, drainage and architectural drawings (all pdf files). I will not place any value judgment on the aestheticness of the new construction. Having more people living in Belfield requires more public transport, especially the lack of evening services to and from Belfield on the 415 bus. For example the last 415 departs Strathfield Station at 2040 while the last 450 bus (formerly the old Red Top 34) leaves Strathfield Stn at 2112, Mon-Fri. There may well be many residents who work late at night. The development application is available at the Strathfield Council site and archived at the archive.org in case the link is broken. I forgot to mention. The former “Pizza Hut” building about to be demolished is the second building to be built on this site. The original 1970 building was gutted by fire (about) 1980 and a new building was constructed as shown in the above photo. In regards to the evening bus services to Belfield, from the 26th November, there will be a slight improvement for the 450 bus, but decrease in services on the 415 bus. Route 415 (govt): Note take the bus from Albert Rd. Route 450 (private) – terminates at Beverly Hills: Note take bus from Albert Rd Strathfield not Mosely St. Conclusion: The late night services for the 415 (govt) bus have decreased from 2040 to at most 2029. For the 450 bus, one has up to 2159 (9:59pm) to catch the 450 bus, an improvement of the previous bus time table of departure time of 2112 (from Mosely St). Relevancy to the original posting: The original posting is a metaphor for increasing development, particularly of home units (um sorry, apartments). People don’t all work a 0900-1700 job. With an increase in population there is an increase in people doing non-0900-1700 jobs and people are stuck with bus timetables that don’t keep up with peoples’ needs. Then we have to consider that the plan within a 1km radius of Belmore station will be for high density units. This will require 415 bus services through Belfield to cater for late night services. The new timetable for the 415 bus is not enough. More so when the rapid transit metro service takes over the standard electric train service from Belmore Station, people in Belfield will need a reliable and safe service to and from the city. Let’s not forget people need to go out for sporting events, concerts and other entertainments, and both 415 and 450 services on the weekends and public holidays is woeful. One wonders if the timetable planners are actually listening to their customers. Where are the representatives from “Transport for NSW” with their clipboards recording people’s opinions in Belfield. Only two days ago, 10-5-2018, the building was standing. As at 12-5-2018 at 1200pm it is almost flattened. Farewell 2nd attempt (about 1980) of the Pizza Hut restaurant. As at 1300, 12-5-2018 at 1300, the place is in the process of being flattened. The sign has gone. I can remember the first Pizza Hut had a sign showing a chef with a long white hat flipping a pizza base. As I recall, the image of the pizza base being flipped looked like a salami or bratwurst sausage being flipped. Anyway the redevelopment of the Pizza Hut is a metaphor for government not providing enough public transport. As more people live in Belfield, and as more units are being developed in the Burwood Rd shopping centre precinct, the new residents would like to have improved public transport at night. Although there was a small improvement in the late evening 450 bus from Strathfield station at 2159 Mon-Frid, that is still not satisfactory since Sydney is a 24 hour city and many of the residents moving into Belfield will be working odd shifts. The day the Olympia is gone is the day I’d go there.